Since receiving jurisdiction from the State Legislature in June 2003 to implement the Georgia Agricultural Water Conservation and Metering Program, the Georgia Soil and Water Conservation Commission (Commission) by year-end 2010 installed more than 10,000 annually read water meters and nearly 200 daily reporting, satellite-transmitted, telemetry sites on irrigation systems located primarily in southern Georgia. More than 3,000 annually reported meters and 50 telemetry sites were installed during 2010 alone. The Commission monitored rates and volumes of agricultural irrigation supplied by groundwater, surface-water, and well-to-pond sources to inform water managers on the patterns and amounts of such water use and to determine effective and efficient resource utilization. Summary analyses of 4 complete years of irrigation data collected from annually read water meters in the middle and lower Chattahoochee and Flint River basins during 2007–2010 indicated that groundwater-supplied fields received slightly more irrigation depth per acre than surface-water-supplied fields. Year 2007 yielded the largest disparity between irrigation depth supplied by groundwater and surface-water sources as farmers responded to severe-to-exceptional drought conditions with increased irrigation. Groundwater sources (wells and well-to-pond systems) outnumbered surface-water sources by a factor of five; each groundwater source applied a third more irrigation volume than surface water; and, total irrigation volume from groundwater exceeded that of surface water by a factor of 6.7. Metered irrigation volume indicated a pattern of low-to-high water use from northwest to southeast that could point to relations between agricultural water use, water-resource potential and availability, soil type, and crop patterns. Normalizing metered irrigation-volume data by factoring out irrigated acres allowed irrigation water use to be expressed as an irrigation depth and nearly eliminated the disparity between volumes of applied irrigation derived from groundwater and surface water. Analysis of per-acre irrigation depths provided a commonality for comparing irrigation practices across the entire range of field sizes in southern Georgia and indicated underreporting of irrigated acres for some systems. Well-to-pond systems supplied irrigation at depths similar to groundwater and can be combined with groundwater irrigation data for subsequent analyses. Average irrigation depths during 2010 indicated an increase from average irrigation depths during 2008 and 2009, most likely the result of relatively dry conditions during 2010 compared to conditions in 2008 and 2009. Geostatistical models facilitated estimation of irrigation water use for unmetered systems and demonstrated usefulness in redesigning the telemetry network. Geospatial analysis evaluated the ability of the telemetry network to represent annually reported water-meter data and presented an objective, unbiased method for revising the network. 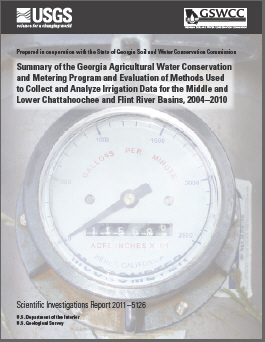 Torak, L.J., Painter, J.A., 2011, Summary of the Georgia Agricultural Water Conservation and Metering Program and evaluation of methods used to collect and analyze irrigation data in the middle and lower Chattahoochee and Flint River basins, 2004–2010: U.S. Geological Survey Scientific Investigations Report 2011–5126, 25 p.